This Flash Enhancer does exactly what its name suggests; enhancing the flash into a much bigger and more impressive pattern. The shorter the barrel length, the larger the flash! 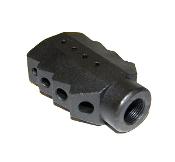 This is designed to works with .223 / 5.56mm rifles with 1/2"-28tpi threaded barrels. Some examples of weapons that this includes are M16 rifles, AR15 rifles, AC-556 machineguns, M-249 machineguns and other types of .223/5.56 weapons.